I'd been meaning to check out Layla Mediterranean Grill & Mezze restaurant for some time, but it kept disappearing from my radar. Then I heard underwriter spots for the restaurant on KUER 90.1 FM, which nudged Layla back to the forefront of my noggin (who says advertising doesn't work? ), and I finally found myself in Holladay, pulling up to the eatery. As soon as I saw the nondescript exterior, I was jolted a couple decades into the past. I realized I'd come upon the location that for many years, was home to Confetti's, a restaurant I could never quite wrap my head around, although it had a loyal following. At Confetti's, you'd find Italian staples next to hummus and baba ghanoush. Throw in a rib-eye steak with Gorgonzola, and you can see why Confetti's had an identity problem. In 2010, Confetti's morphed into Layla Mediterranean Grill & Mezze, still owned by Leila and Raouf Tadros. The restaurant underwent quite an overhaul. Inside, you'll find a very appealing ambience and atmosphere with clever lighting, such as an entire wall lit solely by tea lights. Its look is contemporary yet timeless—in short, a huge improvement over Confetti's. With Layla, you could say the owners went back to their roots; she's from Lebanon, and he comes from Egypt. After they had run Confetti's for so many years—and possibly seeing the success of other Middle Eastern restaurants, such as Mazza—the Tadroses felt like the time had come for Utah to embrace Middle Eastern cuisine and opened Layla. The Black Angus Gorgonzola rib-eye ($30) is still on the menu, but virtually everything else is Middle Eastern. There's a small, attractive bar at Layla where you might stop in for mezze—appetizer-size dishes that go great with a beer, cocktail, Lebanese mint tea, Turkish coffee or glass of wine. I opted for the "Harissa mary," a zesty take on the classic bloody mary, kicked up a few notches with red pepper flakes and Tunisian harissa paste. A good option for sampling mezze are the combination platters, which allow guests to sample slightly smaller-than-normal hot or cold mezze, priced at $14 for three, or $17 for four. Our platterincluded kibbeh, falafel, hummus and muhammara, plus warm pita bread for dipping. I particularly liked the kibbeh: ground sirloin shaped into croquettes and mixed with pine nuts, onions and Middle Eastern spices—allspice, cinnamon and such—deep-fried and served with cucumber-mint yogurt. The fire-roasted red-pepper hummus is equally delicious, especially if you love garlic, andwe also enjoyed the muhammara. It's similar to hummus—a blend of toasted walnuts, roasted red-peppers and pomegranate molasses. I found the falafel to be a tad overcooked and dry, but certainly couldn't complain about the overall value of the mezze combos at Layla. A word about service: Based on visits to Confetti's long ago, I expected to find the same family-style warmth at Layla (the Tadros' kids also work at the restaurant), but wasn't really anticipating the level of service professionalism that we happily encountered. There's a team approach to table service at Layla; the person who takes your order might not be the same one who refills an empty wine glass. Every server seems to be watching every table, so you won't be neglected. Add to that the fact that servers are not only very informed on the ingredients of quite complex dishes, but they also are well-versed in wines, including a number of interesting selections from Lebanon. At the suggestion of our waiter, we sipped a soft white wine from Lebanon with butterscotch notes called Massaya Blanc ($8/glass or $28/bottle), which is lovely with fragrant Middle Eastern flavors. One of my favorite dishes at Layla turned out to be something called musakhen ($17). 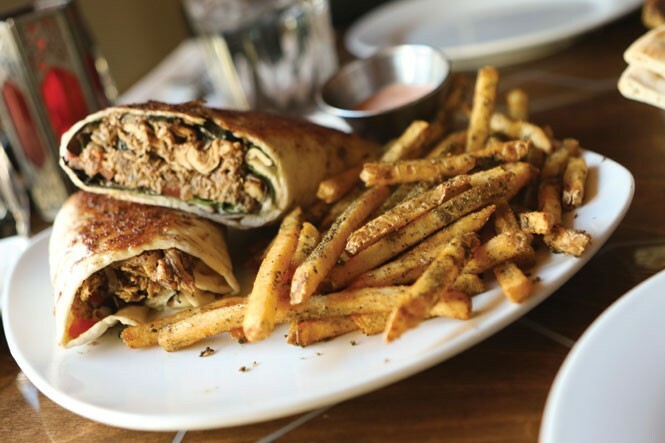 It's a Palestinian dish of toasted, thin flatbread served wrap-style, stuffed with roasted chicken, caramelized onions, pine nuts, sumac and spices. It comes with a choice of Lebanese-style rice and vermicelli or spice-dusted french fries. I love the complexity of the musakhen flavors, which are simultaneously savory and slightly sweet, and the vermicelli rice was outstanding as well. I had high hopes for a dish of Egyptian origin called kushari, but found it to be one with great, unrealized potential. On paper, it sounded delicious, containing many ingredients I like—such as brown lentils, rice, macaroni pasta, caramelized onions and spices, all topped with what is described on the menu as "tangy mild tomato sauce" and crispy fried onions. Well, I absolutely loved the mélange of pasta, rice and lentils—so subtly spiced and nutty-tasting—but the dish was murdered with an immense smothering of bitter (rather than "tangy") tomato sauce. The sauce tasted like slightly diluted tomato paste, and was so acidic that it completely masked the other flavors. And, it killed my wine. It's a shame; where I could scrape off the offending sauce, I loved what was lurking underneath. Next time, I'll ask for tomato sauce on the side. To end the evening, we enjoyed a small but satisfying order of "mini roses" ($5). These are delicate, bite-size rose-shaped pastries (three of them) made with phyllo dough that's been stuffed with cashews and pine nuts, then baked and drizzled with orange-blossom water. It was a delicious finish to a nearly perfect Middle Eastern meal.